I’ve seen a figure of 1.4 million Sanskrit manuscripts currently in existence. 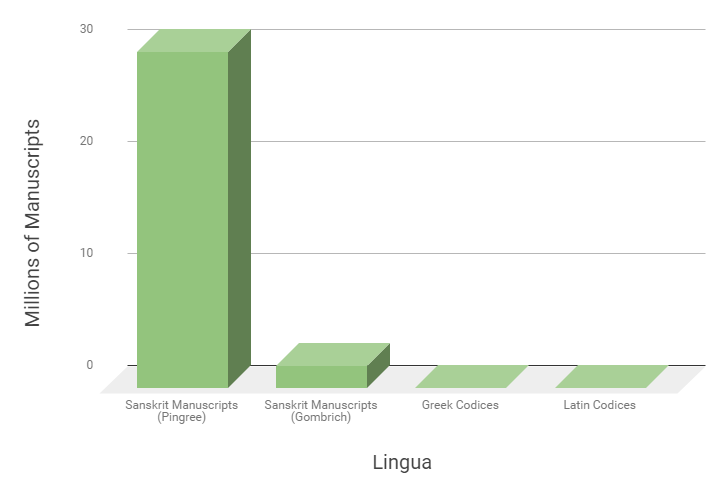 For Classical Greek and Latin combined, there are 30,000 manuscripts. There’s no way you can read Chaucer without a glossary because English is changing so quickly. But I can pick up a Sanskrit document written in the last 2,000 years and make a good fist of it. It hasn’t changed. In 1,000 years time, Sanskrit will still be the same, but every other language will have changed beyond in recognition. As the primary knowledge-bearing and culture-bearing language of India for more than three millennia, Sanskrit has the largest body of written material in the world prior to the invention of the printing press. The Sanscrit language, whatever be its antiquity, is of a wonderful structure; more perfect than the Greek, more copious than the Latin, and more exquisitely refined than either. Sanskrit is an Indo-European language and the key to classical Indian civilization. It could be argued that every great or profound thought and utterance in India before the Year 1000 was probably thought and recorded and transmitted in Sanskrit. We’re talking about the cultural, spiritual and intellectual output of about one quarter of humanity. Sanskrit is not a natural language, in that it was never spoken in the marketplace. It was an artificial system for elite scholarly and spiritual discourse. All languages are artificial of course, but this language was self-consciously constructed as a way of conveying the most sublime, spiritual and intellectual beauty that the human brain was capable of creating, and it does it with extraordinary subtlety. The origins of Sanskrit are lost in the mists of time. A collection of texts called the Vedas probably date from around 1000 BC. 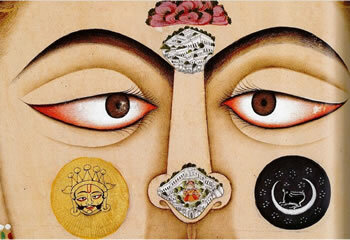 The remarkable thing is that the language in the Vedas is largely recognizable today. But the rules for classical Sanskrit were probably laid down about 300 BC by the great Indian grammarian Pāṇini. From then on it hasn’t changed. It is said that the language defined by those rules is the perfected language. The word for perfection is samskrita, which means ‘made perfect’, so the name of the language already suggests perfection. And if you have devised a perfect language, why would you want to change it? Sanskrit is still spoken, but it’s always been the spoken language of a small, educated intellectual and spiritual elite, particularly in the sacred city of Varanasi and Pune (in India). These two sacred cities are great centres of Sanskritic learning. They are home to whole schools where the curriculum is taught in Sanskrit, and where the kids only speak Sanskrit. There is also a ten minute news broadcast in India each day in Sanskrit. One time I was listening and I heard them say the word for Australia, then the word for Open, then the word for Cup. Open Cup? It was a puzzling combination, until I realised they were talking about the tennis. In pre-modern India, Sanskrit was the language of scholarly discourse, very much like Latin in pre-modern times. But it is also the sacred language of Hindu scriptures. The vast bulk of these still exist and are still used on a daily basis. There are many millions of Hindus who recite prayers in Sanskrit every day. It is also an official language of Buddhism, Sikhism and Jainism. Sanskrit can cope with new vocabulary in very skillful and clever ways. It used old words in new ways. Vidyut means lightening, but it also does for electricity and electronics. Patram means leaf, but also means letter. Vidyut patram, electric letter, is also email. Spam is ‘undesired electric letters’. A Spam filter is ‘sieve for undesired electric letters’. When you say that in Sanskrit it still sounds like beautiful poetry. The language has been very good at adapting to modern usage as well. It’s a highly inflected language. Every noun has to take a particular ending, which would show if there is one object, two objects, or more than two objects. It can also tell you the role of that word in the sentence: if it’s the subject, it takes a particular ending. If it’s the object, it takes another. If you want to say ‘with that thing’, ‘for that thing’, ‘from that thing’, ‘on that thing’, ‘of that thing’, it takes other endings. As endings can be singular, dual or plural, there are actually 24 different versions. Any noun can take 24 endings. And there are 28 different patterns that you need to be more or less on top of. So it’s 28 times 24 different ways of expressing a noun. Then there are hundreds of possible verb endings. It’s complicated. Panini reduced Sanskrit grammar to 4,000 handy rules. All you have to do is memorise these 4,000 handy rules and you’ve got it down pat. Sanskrit has an alphabet. So after a little bit of hard work you can master it. It’s written in a beautiful script called Devanāgarī, which means ‘of the city of the gods’. If the gods ever had to write anything down, I’d be pretty sure they’d be writing it in Sanskrit, and that they’d be writing it in Devanāgarī. ‘My name is’ is a very nice example for newcomers to Sanskrit, because it’s very Indo-European. ‘My’ is mama, and ‘name’ is nama, and then you add your name to it. It’s easy, but there is a whole lot happening under the surface. Mama is first person singular genitive, one of the 24 ways of saying ‘I/we’. Nama is neuter nominative singular. That short ‘a’ ending is one of the 24 ways of saying name. I’ve seen a figure of 1.4 million Sanskrit manuscripts1 currently in existence. For Classical Greek and Latin combined, there are 30,000 manuscripts. This is Sanskrit’s monument, that vast scope of surviving, hand-written documents sitting in people’s libraries and temples. The size of the corpus is absolutely enormous. And the breadth of material boggles the imagination. Everyone knows the Kama Sutra, for example, which is a manual on sexual technique. But there are also texts on elephant-raising, architecture, astrology, medicine, grammar, spiritual traditions, geography – the vast scope of subjects covered by Sanskrit documents is amazing. An elderly Sanskrit scholar, who had spent 50 years studying the language, was once asked what it was like to have spent so long on the subject. He replied, “Sanskrit is a boundless ocean, and I am still standing on the shore”. There is no such thing as finishing Sanskrit. You don’t have to worry about getting anywhere. You should always look behind you and get your satisfaction from what you’ve done, because it’s a journey without an end. I am the only person, possibly in the world, who truly believes that Sanskrit is the language of the future. We can’t easily read Shakespeare without a glossary. There’s no way you can read Chaucer without a glossary because English is changing so quickly. But I can pick up a Sanskrit document written in the last 2,000 years and make a good fist of it. It hasn’t changed. In 1,000 years time, Sanskrit will still be the same, but every other language will have changed beyond in recognition. 1.The figure is actually 2 million manuscripts and was quoted in Richard Gombrich’s inaugural lecture at Oxford.